Just a Girl and her KitchenAid: Giant Cupcake- my first ever birthday cake! 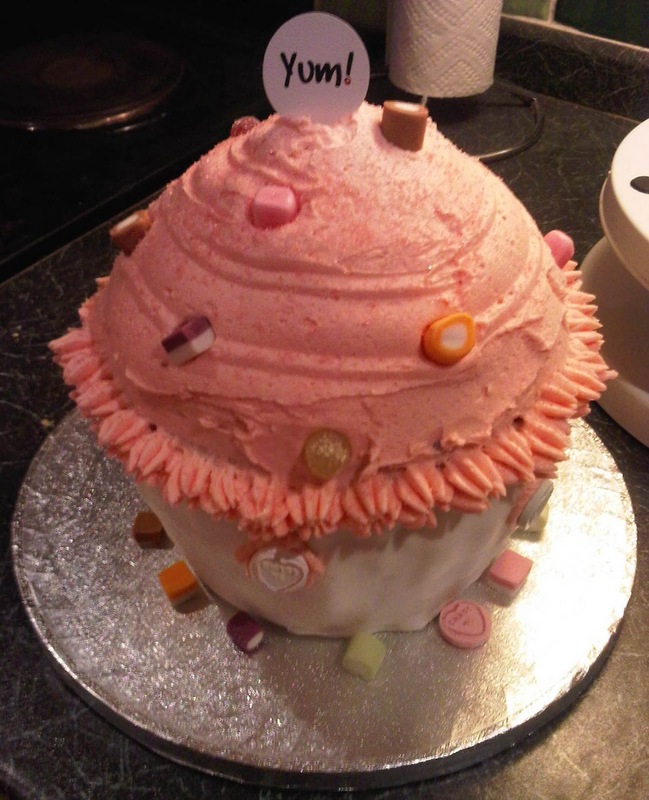 Giant Cupcake- my first ever birthday cake! I've recently become bored of being restricted as to what I can bake. As my parents and brother are on diets and my boyfriend is a bit of a picky eater, my creativity is limited. So, when my friend told me she was looking for a cake for her daughter's birthday, I begged her to let me attempt it. We agreed that it would be a large cupcake and the rest really was down to me. I've never made a birthday cake and making it in a situation where I wouldn't be able taste it scared me a lot! I'm also a complete novice at decorating cakes so I had planned a test bake but I never got round to it. The cake went into the oven looking most promising! There are a lot of things I wish I had realised beforehand that a practise run would have eliminated. Firstly, I wish I'd cooked it for longer, all the signs were there for a perfectly cooked cake but, once cooled, I began to worry. This then caused me to cut it in half (at a dodgy angle) and fill it with jam and buttercream which all merged together into one slop. This stressed me out hugely and at one point my mum even suggested I start again!! I ended up walking away and going back to it a while later, in a much less stressed state. After some icing and a bit of decoration, the cake was completely transformed and I think it turned out really well, even if it does have a bit of a pointy tutu going on! So, not much to report and not a lot of pictures but apparently it went down really well and Jayden absolutely loved it! Set the oven to 180ºC and grease the tin using cake release spray or groundnut oil. Cream the butter and sugar and add the vanilla. Beat for about 5 minutes. 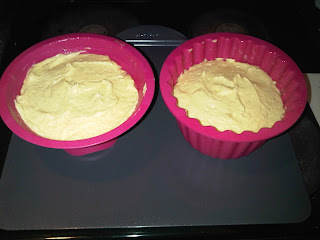 Add one egg at a time with a third of the sieved flour and baking powder until it has gone then add the milk and beat slowly until it is mixed in. Place half of the mixture in each side of the tin to about ¾ full and bake for 50 minutes. Times really depend on your own oven, so start to check the cake at 50 minutes, then every 10 minutes and do not remove from the oven until the cake is springy to the touch. This might take up to 1 hr 15 minutes. Remove from the oven and let it cool for 20 minutes before tipping out. If the cake has overflowed or has risen too high don’t worry, you can trim this with a bread knife or a cake leveller. It’s easier to do this while it is still in the tin. Hold the cooling rack tight over the top of the tin and turn them out to cool. Once the cake is totally cool (probably an hour or 2) you can start decorating it. Colour and roll out the fondant icing to a ¼ of an inch thick. It has to be 25cm in length and 8cm high. Melt some jam in the microwave and leaving the cake in the upside down position brush over the base of the cake. This helps the fondant stick. Place the fondant around the cake and trim the excess. You can fold a little over the top (which is the bottom) so you have a clean edge. Press your finger round the indentations so you get the shape of the base back. Then turn the cake (not gripping too hard or you will squash it) the right way up. Beat the butter, icing sugar, milk and vanilla together in a bowl until light and fluffy. Put a third of the buttercream in another bowl and add pink food colouring to it. Reserve this for your buttercream roses. Spread jam on the bottom half of the cupcake, then the icing and sandwich the two pieces together. Loving the tutu - what a pretty cake! Congrats the cake, you wouldn't know it was your first. I'm loving the cake's little tutu. Can't go wrong with dolly mixtures either! Thanks guys, just wish I had tried to flatten the points!